Users and user roles can be controlled directly by the Cloud Administrator when setting up the Cloud File Server. Once shared folders for the Cloud File Server have been added, the Cloud File Server Admin can control access to folders and sub folders using an access control list. 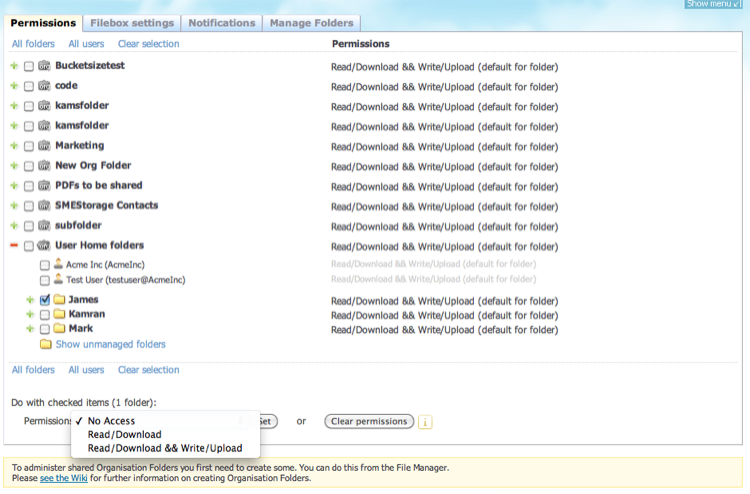 If a user has no permission to a folder the folder is not displayed at all in their file tree. FAQ: We often get asked if we support Active Directory integration. We support Active Directory integration, and this enables single sign on and group permissions federation. You can find more about Active Directory integration on our Wiki here. The Cloud File Server Admin can setup notifications. 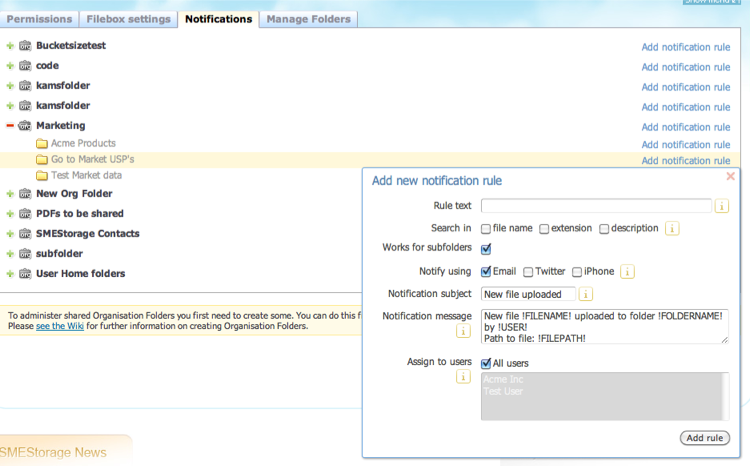 Notifications are based upon rules that are invoked on file events. If a file of a certain description, file name or extension is uploaded, updated, viewed etc, then the nominated users can receive notification alerts. Auditing is built into the Cloud File Server and it works above any information Cloud that is mapped to the fileserver. 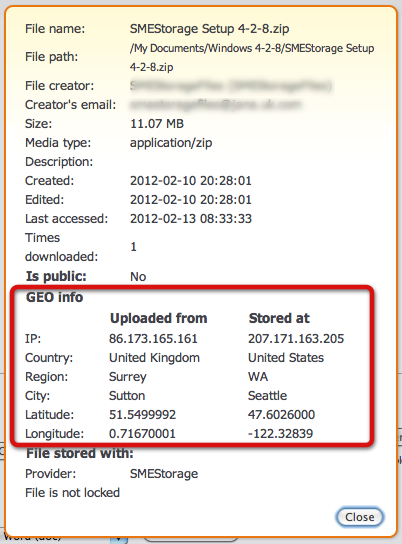 The granularity of the events that are logged s controlled by the Cloud File Server Admin. Event logs are generated if auditing is turned on and these can be displayed, filtered, exported or archived. The Cloud FIle Server Admin can disable any sharing or collaboration features of the Cloud File Server entirely by disabling the ability for any user to do any form of file sharing or collaboration. As the Organization, or individual users, may user other information clouds, it is preferable for these to be controlled as part of the Cloud File Server rollout in a company. This will enable that any auditing, event logging etc can be setup for such clouds. 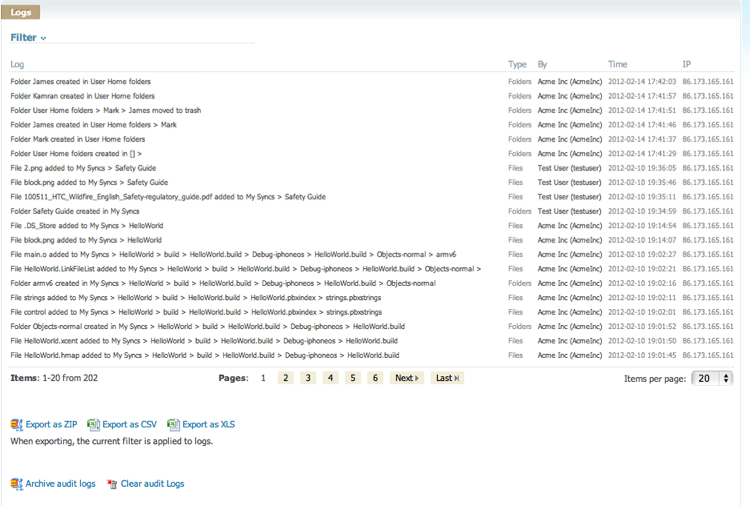 The Cloud File Server admin can decide which Clouds a user can add. For example if each user has a corporate Google Apps Docs account, then the Admin can enable users to add this directly, and any use of it can also be monitored and audited. 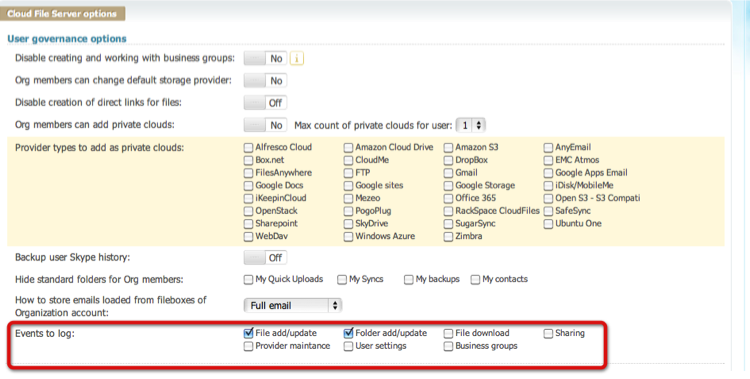 Cloud Admins can choose for all files to be encrypted when stored on Cloud. This encryption is AES 256 bit military grade encryption. To ensure the lifecycle of a file is tracked then file versioning can be turned “on” which results in all changed versions of a file being kept rather than overwritten.